People have used extracts of poppies to ease pain since the time of the Byzantine Empire. The active component, morphine, was isolated in 1804. And the receptors that mediate the effects of morphine and other opioids were identified in the early 1970s. 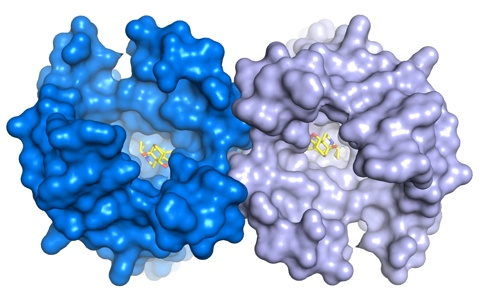 At last, researchers know what the receptors look like, as two independent groups now report high-resolution crystal structures of not one, but two opioid receptors, μ (mu) and κ (kappa). Brian Kobilka at Stanford University School of Medicine in California, US, and colleagues describe a structure of the μ receptor, the target of morphine and many other analgesic drugs, while a team led by Raymond Stevens at The Scripps Research Institute in La Jolla, California, US, tackle the κ receptor. Each receptor has a large ligand-binding pocket, and the researchers identify features that may mediate tight, selective binding, which could help drug developers find more potent, specific, and non-addictive painkillers. Both papers appeared online March 21 in Nature. Opioids have unmatched effectiveness, but their side effects are legion. Morphine and other μ-targeted drugs can cause nausea, constipation, respiratory depression, sleepiness, dependence, and abuse. Compounds that bind the κ receptor are candidates for relieving pain without the risk of addiction, but they introduce other problems, especially depression and hallucinations. The problem is that opioid receptors are present throughout the central and peripheral nervous systems (and GI tract) and have many biological roles, and existing drugs are poorly selective. To avoid side effects, researchers and drug makers are aiming to make the compounds selective for particular receptor subtypes and downstream signaling pathways. In their attempts to better target opioid receptors, however, researchers have been flying blind: While structures exist for a few receptors in the vast G protein-coupled receptor (GPCR) family, none are opioid receptors. The new structures display the canonical GPCR bundle of seven membrane-crossing helices. One striking feature of both the μ and κ receptors is the large ligand-binding pocket on the extracellular side. The Kobilka team, co-led by Sébastien Granier, previously a member of Kobilka’s lab and now at INSERM in Montpellier, France, crystallized the mouse μ-opioid receptor with a morphine-like irreversible antagonist, β-funal-trexamine (β-FNA). The Stevens group crystallized the human κ receptor with the small-molecule antagonist JDTic, which is in early-stage clinical testing as a potential treatment for depression, anxiety, and drug addiction. Both compounds are receptor subtype selective and tight binders, and the structures clearly depict their points of contact. In addition, the investigators used sequence comparisons, mutational analysis, and computational binding simulations to identify structural features that may determine ligand selectivity for μ, κ, or another opioid receptor, δ (delta). The roomy binding pockets offer myriad spots where drugs might attach and alter receptor activity in distinct ways. Having the structures will streamline efforts to identify new ligands, said F. Ivy Carroll and S. Wayne Mascarella, whose team at Research Triangle Institute, North Carolina, US, developed JDTic, and who are both authors on the κ structure paper. The new findings make possible virtual screening to sift through hundreds of thousands of compounds, they told PRF. One caveat is that the current structures may not be exactly those that drug developers need to target. In both structures, antagonists freeze the receptors in inactive states, whereas pain-relieving drugs activate the receptors. So Kobilka says the current work is just the beginning. “We’re going to have to get other structures—structures in active states,” he told PRF. In fact, opioid receptors do not just toggle between “on” and “off” conformations, but exist in many configurations, Kobilka said. Researchers are realizing that ligands can bind in “biased” or “functionally selective” ways, meaning that drugs could catch the receptors in just the conformation that elicits the desired downstream events (see PRF related news story, and for a review, see Raehal et al., 2011). Kobilka hopes to determine structures with ligands that favor various signaling pathways to help medicinal chemists develop more functionally selective drugs. In particular, he said, visualizing binding of the receptors’ natural activators—peptides such as endorphins—could suggest how to design synthetic compounds that activate the μ receptor without being addicting. The structures may also inspire drug developers to look outside the binding pockets. In both the μ and κ crystals, the proteins associate intimately in dimers, lending support to existing notions that opioid receptors function in complexes. Thus far, Bruchas said, ligand development has operated largely on the assumption that the receptor is a monomer, so tweaking the formation of multiprotein complexes might be a fruitful route to targeting the receptor. “I think seeing it as a dimer is going to turn some heads,” he said. 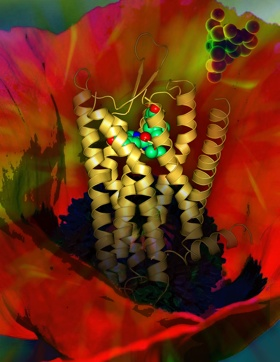 Top image: The binding pocket of the μ-opioid receptor, with a morphine-like ligand. Credit: Kobilka lab. Crystal structure of the µ-opioid receptor bound to a morphinan antagonist. Nature. 2012 May 17; 485(7398):321-6. Epub 2012 Mar 21. Nature. 2012 May 17; 485(7398):327-32. Epub 2012 Mar 21. What will the new crystal structures mean to therapeutic development? The μ- and κ-opioid receptors could be considered the yin and yang of opioid receptors as their endogenous ligands transmit seemingly opposing physiological responses. Whereas agonists to the μ-opioid receptor (MOR) are renowned as potent analgesics (think morphine), activation of the κ-opioid receptor (KOR) by its endogenous agonist, dynorphin, can mediate painful responses. Furthermore, while MOR activation promotes euphoria, KOR activation leads to dysphoria. Perhaps, physiologically, these two receptors act in concert to maintain balance. The current high-resolution crystal structures of these receptors may provide insight into how agonists bind and, therefore, could direct the design of new ligands. This will be immediately important for the development of ligands that are selective for one receptor over the other. In addition to providing insights for selective agonist design, the crystal structures may also open new avenues into fine-tuning therapeutics for improved efficacy. This may be inspired by the emerging realization that the chemical structure of the ligand can induce the activation of distinct signaling cascades downstream of the receptor. It is believed that the binding of the ligand will impart a change in the conformation of the receptor structure that will impart differential affinity for, or exposure to, downstream signaling messengers (such as G proteins or arrestins). For example, there is significant evidence to suggest that an agonist that promotes G protein coupling rather than inducing arrestin interactions with the MOR may produce significant analgesia with limited development of constipation or respiratory suppression (Raehal et al., 2011). With researchers actively probing the biology for physiologically significant signaling downstream of μ- and κ-opioid receptors, opportunities begin to become apparent for generating ligands that will not simply bind to, but communicate direction to, receptor signaling by affecting the structure. The major advance of these reports is that we now have these structures in hand. Further, the authors have demonstrated, particularly for the KOR, that the ligands bind in distinct manners. The fun begins when we start to determine how the biology correlates with the docking—especially when the biology can be correlated with particular signaling pathways that are invoked by the ligand binding. Raehal KM, Schmid CL, Groer CE, Bohn LM. (2011) Functional selectivity at the μ-opioid receptor: Implications for understanding opiate analgesia and tolerance. Pharmacol. Rev.63(4):1001-19. Epub 2011 Aug 26. I think Laura Bohn really hits all the key points here. Having this "snap snot" of the μ-opioid receptor (MOR) and κ-opioid receptor (KOR) will presumably tie neatly into the work on going within several groups in the opioid field, including the influential work by her group, that suggest that these receptors occupy numerous conformations that each can have dramatically different effects on signaling, physiology and behavior. Now that we have a map (a picture really) of both of these receptors we should be able to have a better basis from which to rationally screen compounds for these receptors that stabilize their various conformations. What is still remarkable to me is that when I saw Kobilka talk, he mentioned that he doesn't think the receptors physically move that much in space, even though he agrees that they move in diverse conformations. By that, I mean, they might only move 20-30 A (someone correct me on the actual distances, if I am mistaken), which seems like a very tiny amount to convey such a large array of signaling pathways. Also, I continue to be occupied with the data showing that both receptors packed as dimers. Whether this is more of an artifact of crystallization or really how they exist, will likely remain hotly debated. Frankly, seeing them this way, convinces me even more that the dimer state is a real, functionally relevant entity at opioid receptors and should help to persuade others in the field that are skeptical of GPCR dimerization to be take a more open minded approach to the concept, as we move forward.